South Side stories are often journey stories. From where you were to where you are, from where you are to where you’re going. This week, Rebeca Nieves Huffman joins us to talk about how life took her from Humboldt Park to Beverly and all the spaces and places in between. 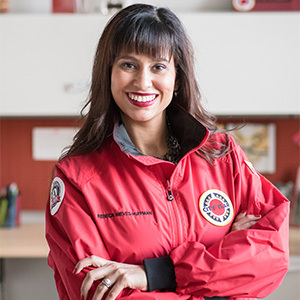 Rebeca serves as Executive Director of City Year Chicago. Her passion for education began there, when she served as a corps member for two years (1998 and 1999). During her service, she led a team of corps members at Brian Piccolo Elementary in the Humboldt Park Community, the same community where she grew up. Today, Huffman is leading the organization with the goal of providing 230 tutors, mentors and role models to students within their 26 high need partner schools. Having been the first in her family to attend and graduate college coupled with being exposed to the crisis in public education through her time as a City Year corps member, Huffman has dedicated her life’s work to quality education opportunities for students in neighborhoods of limited resources. Rebeca has served in a variety of leadership roles within and around the K12 education system locally and nationally. As the Associate Director of Recruitment and Selection for the KIPP School Leadership Program, she recruited talented and passionate educators to start their own middle schools and learned how school leaders/principals are critically important catalysts for student achievement in high need schools. As the founding president and CEO of the Washington DC based Hispanic Council for Reform and Educational Options (Hispanic CREO), she led stakeholders across all sectors to advocate for policies that support Latino students, which represent the country’s fastest growing yet among the most vulnerable populations. She was also the Vice President at the National Association of Charter School Authorizers (NACSA) where she created and managed their first grant-making program. An alumnus of the Aspen Institute’s Fellowship for Education leaders, Rebeca has a deep commitment to develop the next generation of leaders in her community. She is a fellow with the current class of Leadership Greater Chicago and serves on the board of the Noble Network of High Schools. She resides on the South Side of Chicago with her husband, Craig, and her school-aged children Sofia and Solomon. Join us this Tuesday in The Frunchroom! This entry was posted in Lineups and tagged Rebeca Nieves Huffman, september 25. Bookmark the permalink.